Last week, Princess finally signed a firm contract with Fincantieri for the two new 141,000-ton cruise ships first reported in February, while the Paquet brand has been revived with the inaugural sailing of the Allegra from Marseilles on Friday. Meanwhile, TUI-owned Island Cruises is contemplating adding a second ship after Ocean Village closes down and Carnival has announced its largest ever program for Bermuda. The Royal Princess and Regal Princess? Last Tuesday, Carnival Corp & PLC's Princess Cruises placed a firm order with Italy's Fincantieri for its two prototype ships, as yet unnamed, to be delivered in 2013 and 2014. One source, however, has speculated on Royal Princess and Regal Princess as possible names to be chosen. 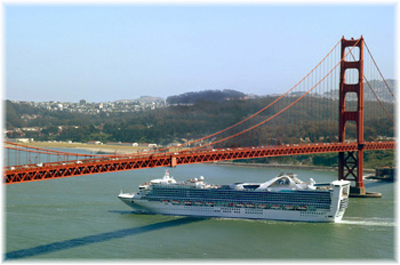 The first Royal Princess was a trend-setter as the first ship to have so many balconies and the second is about to be transferred to affiliate P&O, while the Regal Princess was one of the Renzo Piano-designed pair that were originally ordered by Sitmar but delivered to Princess, and has sailed as the Pacific Dawn for P&O Australia since 2007. At 141,000 gross tons, the new Princess flagships will accommodate a maximum of 3,600 passengers and will be the largest cruise ships ever built by Fincantieri. Built to a prototype design, many of the best concepts will come from the Ruby Princess, the last ship to completed for Princess by Fincantieri in 2008. It will thus be a gap of five years between new ships for Princess. Further design details have not yet been made public but it will evidently include a number of successful touches from previous Fincantieri vessels and also some firsts. For instance, all outside cabins will feature private balconies, which will account for 80% of the accommodation. Public rooms will apparently also be enlarged compared to previous Princess ships and will incorporate a somewhat more luxurious décor than in the past. Princess Cruises now operates seventeen ships, and the two new ships will be the largest in any Carnival fleet, with the sole exception of the 148,528-ton Queen Mary 2. Fincantieri has built 53 cruise ships since the 1990s, of which 49 were for Carnival brands. A further twelve, including the two Princess ships, will follow by 2014. The French cruise market is seeing quite a revival at the moment. Hard on the heels of the maiden voyage of Compagnie du Ponant's Le Boréal from Marseilles last Thursday, Friday saw the relaunch of the Paquet brand when the Allegra sailed from the same port on the first of eleven cruises under the Paquet brand for 2010. In an agreement with TMR of Marseilles, Costa Cruises, who have owned the Paquet brand since 1996, are using the Costa Allegra, marketed in France under the name "Allegra," for four spring cruises and seven cruises this autumn. For these cruises, the Costa Allegra will feature a French master, cruise director, maitres 'd, receptionists and two French chefs, one of whom, Jean Abauzit, served on board the renowned Mermoz, retired a decade ago. Allegra's first three cruises are sold out, although some space is still available on the June 16 departure, which will be a musical cruise celebrating French song. TMR, headed by Jean-Maurice Ravon, has in the past chartered the Norway (ex-France) as well as a couple of the ex-Renaissance "R" class, and is celebrating its 20th anniversary this year. As well as Le Boréal and Allegra in the French market, Croisières de France's all-inclusive Bleu de France returned from Brazil last month and has now commenced her summer series of Mediterranean cruises, also from Marseilles. Island Cruises To Go To Two Ships? During the introduction cruise of the Thomson Dream, the former Costa Europa and latest addition to TUI's Thomson Cruises fleet, its director of cruising David Selby let slip that rather than absorbing Island Cruises into Thomson Cruises, as had once been mooted, Island could go back to being a two-ship brand by 2012. 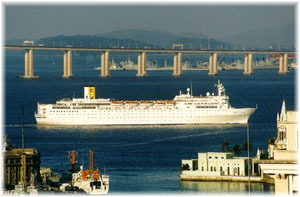 Island's original ship, the Island Escape, remains, but it lost its second ship when former partner Royal Caribbean withdrew the Island Star and transferred her to Pullmantur Cruises. 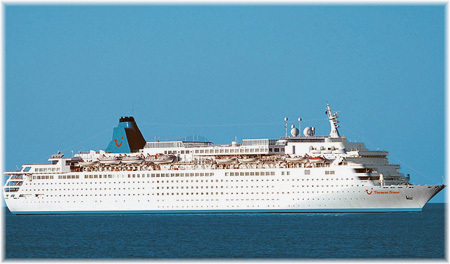 While Thomson Cruises has been pulling in good scores with British cruisers, Island Cruises has been retained as an alternative all-buffet dining cruise operation and Selby does not expect a lot of crossover between the Thomson and Island cruise brands even though they both offer cruises from La Palma. With the demise of P&O's Ocean Village, a buffet dining cruising equivalent to Island Cruises, this autumn, when the Ocean Village transfers out to P&O Cruises Australia this could mean additional business for TUI's Island Cruises if P&O are not able to atract repeat Ocean Village customers over to P&O or sister brand Princess. Bermuda's traditional April to October cruise trade began again last month with the first regular calls at Hamilton's Front Street cruise piers since the Azamara Journey completed her Bermuda cruise season in 2007 by Holland America's Veendam. With Holland America being a newcomer to the Bermuda trade this year, its Veendam will make 24 cruises from the New York direct to the Front Street cruise ships docks in Hamilton, with a tender call at St George's en route. One call will also be made by the line's Prinsendam. This year actually marks a return by Holland America to the Bermuda trade, where it had been a regular caller until the 1980s when it moved its centre of operations from New York to Seattle. Other regular callers this year include Norwegian Cruise Line, with 45 calls by the Norwegian Dawn from New York and Norwegian Spirit from Boston, and Royal Caribbean, with 40 calls by the Explorer of the Seas from Bayonne, New Jersey, and Enchantment of the Seas from Baltimore to either King's Wharf or Heritage Wharf, both located at the old Royal Navy Dockyard and served by ferry running into Hamilton. Celebrity Cruises will also offer seventeen cruises with their Celebrity Summit and Princess Cruises ten with their Caribbean Princess. 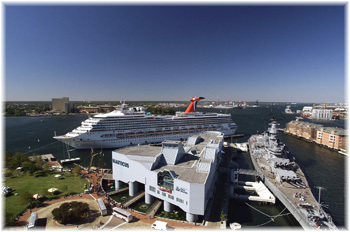 Last Friday, however, Carnival Cruise Lines announced that it would offer a total of sixteen cruises to Bermuda in 2011, six from Charleston by the Carnival Fantasy, five from Baltimore by the Carnival Pride, four from New York by the Carnival Miracle and one from Norfolk by the Carnival Glory, all docking at King's Wharf. This year will see only one Bermuda call by the Carnival Miracle from New York but 2011 will see the largest number of Bermuda calls ever made by Carnival Cruise Lines, bringing them to No. 5 place after NCL, Royal Caribbean, Holland America and Celebrity, and within one call of Celebrity at No. 4.